﻿ iBackuper - Backup iPod media to your PC. Backup iPod files to your PC. Backing up iPod with a few clicks. "How do i backup my iPod files to PC?" Finally we have got a solution for backing up iPod and any iDevice! This iPod backup program is a unique tool that gives you unlimited rights for iPod media library control. You will be able to back up iPod music, transfer music and video from iPod, iPhone or iPad to your hard drive and manage them without launching iTunes. iBackuper is transfer music from iPod to computer software that saves your iPod media files to your PC as a backup and you can use them as you want: play on your PC, edit and copy to another iPod, iPad or iPhone, or just restore them to the original device whenever you need. Backing up iPod, restoring and managing media files on your iDevice is now just as easy as using it, thanks to iBackuper. Reclaim full control of your favorite media gadget - backup music from iPod in a few clicks. Save your time - backup iPod! You never know when and where you need your music or video files. 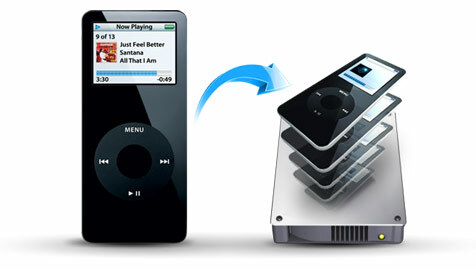 Do iPod music backup with iBackuper and you'll be ensured from unexpected data loss. iBackuper supports media backup and restore for all Apple portable devices: iPhone, iPad and iPod music backup. So, how to backup your iPod? Now with iBackuper, backup music from iPod to computer is extremely easy. Make sure that you have iTunes installed on your PC. Connect yours or your friend's iPod/iPhone/iPad and start to backup iPod. Then you can keep files saved on your PC, edit them, keep to future restore or copy to another device. No limits for you, no iTunes restrictions anymore!